That title is not mine. I wish I could claim it: it’s brilliant. But it belongs to Jorge Giordani. It’s what he meant to call a book he wanted to write about La Revolucion Apparatchik. We hear about it in a long Contrapunto interview with perhaps the second figure most responsible for the mess we’re in. The Alternative Bolivarian Plan. Here I must confess some envy: these folks had plans! 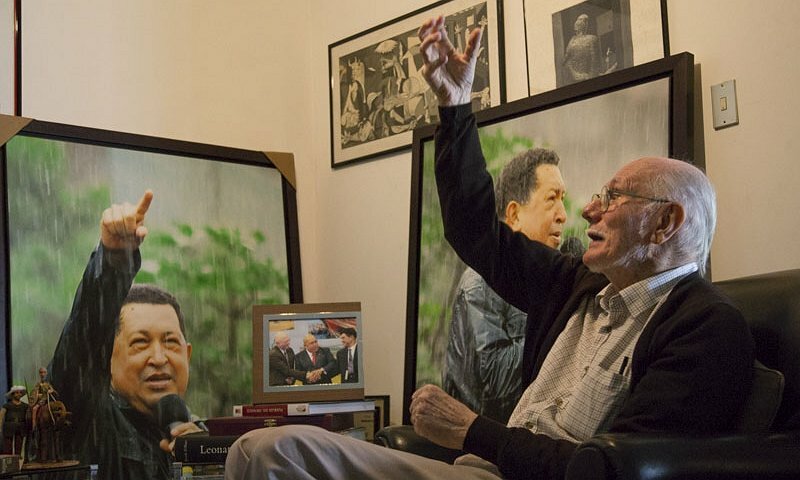 As early as 1993, Giordani was wonking away, and he calculated that the Venezuelan social debt was of about $100 billion. That’s it. You pay 100 billion and Venezuela would then become a star-sparkling-awesome place. No poverty, no issues. And we would still get to keep the nice weather. Something I find interesting is that Chavez would tell him: “the debt isn’t 100 billion, it is 40 years”. I can hardly make something out of that. The income actually did total $1 trillion. But you know that, right? Here is something that will start giving you an eye twitch: $350 billion of that are unaccounted for. You know, “they fell through the cracks”. And Giordani seems to think that’s not that big a deal. The $350 billion figure isn’t actually the worst of it. Think of it this way: if $350 billion are unaccounted for, that means $650 billion were spent and accounted for. That’s almost worse! They spent, and kept track of, nearly seven times the amount of money they’d originally thought they’d need to make Venezuela a kind of tropical Switzerland. And what do we have show now? A second bridge over the Orinoco? Venezuela today has the same assets and the same poverty levels of 1998. And let me remind you that 1998 Venezuela went through the one of the worst economic crises. A decade of low oil prices. Somehow, with quite a different scenario, high oil prices and a decade of economic growth – we managed to end up in the exact same place. But Giordani is only the second in line to blame. And he makes sure that you blame number 1. Chavez himself. Why was Chavez so inept with these matters? According to Giordani it was fear of losing. That, and his “generosity”. And Chavez got his way, every time. The biggest mistake. To allow the parallel exchange rate. To decriminalize it. To be fair he also saw the issuing of bonds to PDVSA as problematic. At least there we agree. The solution. Well, of course, more radicalization! Nationalize the finance sector and the international trade sector. Now that will work! As for the book, he will write it, I personally look forward to reading it. A chavista version of Naím’s Paper Tigers and Minotaurs. As much as we like to gloat and say “I told you so” and how wrong chavistas were, it is still concerning that any possible opposition-led government … won’t actually deliver a plan. Only improvisation through and through.